Shopping and spas – they’re the two vital ingredients for any girls getaway. Happily, Abu Dhabi offers an abundance of both. Abu Dhabi is home to some of the world’s finest luxury shopping experiences, with the new Yas Mall adding even more enticing outlets to the Emirate’s exclusive shopping offering. Opening this November, YAS MALL will set a new benchmark in cutting-edge design, retail, dining and entertainment offerings. With over 450 stores, four international department stores and fashion boulevards, it will be a catwalk of world class retail brands. Located in the region’s most exciting leisure and entertainment destination, Yas Island, Yas Mall is set to be the second largest shopping mall in the Emirates. THE GALLERIA Sowwah Square has the highest concentration of luxury brands in the Arabian Peninsula. The new complex on Al Maryah Island boasts some of the finest bespoke and luxurious clothing and jewellery worldwide and it is all a stone’s throw away from the city centre. A selection of the finest designers has taken up residence in The Galleria with the likes of Christian Louboutin, Jimmy Choo and Mulberry. AVENUE AT ETIHAD TOWERS offers a vast array of luxury designer brands including Burberry, Cartier, Hermès, Hervé Léger, Manolo Blahnik and Versace. One of Abu Dhabi’s original boutique destinations, it showcases the very latest in fashion, accessories and jewels – an experience further enhanced by the extensive dining options and a gourmet food store. After a long day of shopping, relax and unwind in one of Abu Dhabi’s finest spas. Here you can experience the ultimate journey to wellbeing, relaxation and rejuvenation. 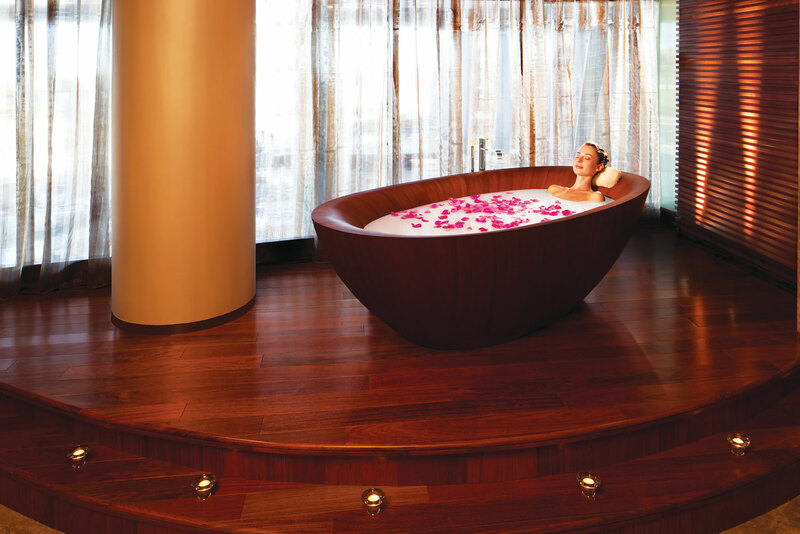 With an endless array of premium pampering experiences, you’ll be treated to pure luxury. The tranquil EDEN SPA & HEALTH CLUB AT LE MERIDIEN is a certified green key property, which offers a wide range of unique Ayurveda and oriental massages including Thai, Chinese, and Shiatsu and Balinese therapies. Enjoy a soothing personalised treatment at TALISE SPA AT JUMEIRAH AT ETIHAD TOWERS, an oasis of calm and tranquillity just moments from the buzz of the city. A luxurious retreat experience, Talise offers a new generation of treatments that transport you to a healing, serene state of mind and body.